Watch portions of the news conference announcing the release of the latest Prescription Drug Abuse Report Card. Speakers include County Supervisor Kristin Gaspar and Sandy Nolan, whose son died from an overdose. Local prescription drug deaths have set a new record. Deaths due to heroin have dropped. But fentanyl deaths have skyrocketed. 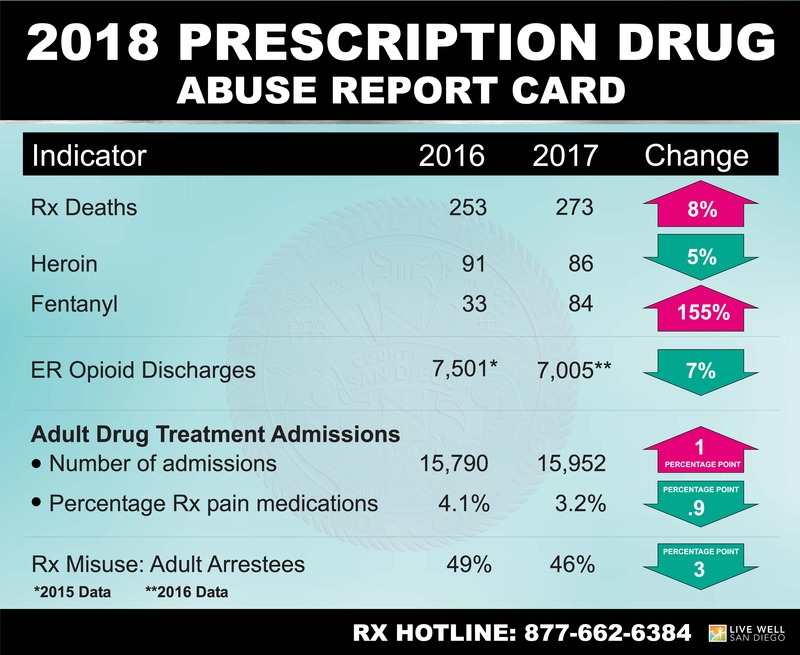 Those are the main results of the County’s 2018 Prescription Drug Abuse Report Card released today. The latest report shows 273 San Diegans died from prescription drugs last year, an 8 percent increase from 2016 when 253 fatalities were reported. The previous record was set in 2012, when 268 prescription drug deaths occurred. Prescription drug abuse is an equal opportunity killer and can affect anyone, crossing socioeconomic status, ethnicity, gender and age. The fact is, unintentional drug-related deaths continue to rise. 7,001 visits to local emergency rooms in 2016, compared to 7,501 in 2015. Data for last year won’t be available until 2019. 10 percent of 11thgraders reported prescription drug abuse in 2017 vs. 14 percent in 2015. Survey is conducted every two years. 47 percent of adults arrested reported misusing prescription drugs in 2017, compared 49 percent in 2015. 25 pharmacy store burglaries and robberies occurred in 2017 vs. 14 in 2016. 46 percent of juvenile arrestees reported abusing prescription drugs last year vs. 40 percent in 2015. 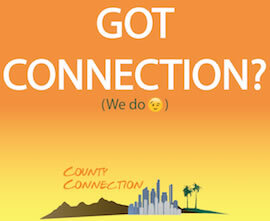 The County and its multiple partners began addressing the prescription drug abuse problem in the region 10 years ago. In 2008, the County Board of Supervisors established the Prescription Drug Abuse Task Force, which includes the County Sheriff’s Department, the District Attorney, the Health and Human Services Agency, the U.S. Drug Enforcement Administration, and multiple other key partners including local law enforcement, treatment, and health and prevention organizations. A total of 86 deaths from heroin were reported last year, compared to 91 in 2016. A record 105 heroin deaths were reported in 2014. The heroin problem in the region continues to be fueled by prescription drug abuse. Heroin is cheaper and easier to get so prescription drug users turn to heroin and synthetic opioids when painkillers become harder to find or more difficult to pay for. Combined, prescription drugs and heroin killed 359 people last year, 15 more than in 2016. Another troubling trend occurring in the region is the skyrocketing number of deaths because of fentanyl, a synthetic opioid that is 50 to 100 times more potent than morphine and 25 to 50 times stronger than heroin, even in tiny doses. Last year, 84 people died from fentanyl, 51 more fatalities than the 33 reported in 2016. This is the highest number of deaths from fentanyl ever recorded in San Diego County. As little as two milligrams of fentanyl is a fatal dose for most people. Because of its potency, fentanyl overdoses may require additional Naloxone, a medication that reverses overdose from opioids. “We have seen a steady increase in fatal overdose cases over the years where fentanyl has been added to opiates,” County Chief Medical Examiner Dr. Glenn Wagner said recently. In September, local law enforcement and health officials warned the public about a spate of deaths in beach communities connected to cocaine laced with fentanyl. In total, 527 people died from overdoses and other circumstances involving prescription drugs, alcohol, heroin, fentanyl and other illegal substances. Everyone is encouraged to get rid of unused medications so they don’t fall into the wrong hands. Safe disposal and collection of prescription drugs started in San Diego County 2009. The national Take Back days started in 2010 and now occur twice annually. Also, in partnership with the San Diego Association of Realtors, the Safe Homes Coalition and several community partners sponsor a community-driven effort to take even more prescription drugs out of homes to be safely disposed. The Safe Homes Coalition’s Keep Kids Safe Program gives plastic bags to real estate professionals for their clients so that they can secure their prescription medications while their home is being shown to potential buyers. So far, more than 10,000 bags have been distributed to San Diego homeowners. 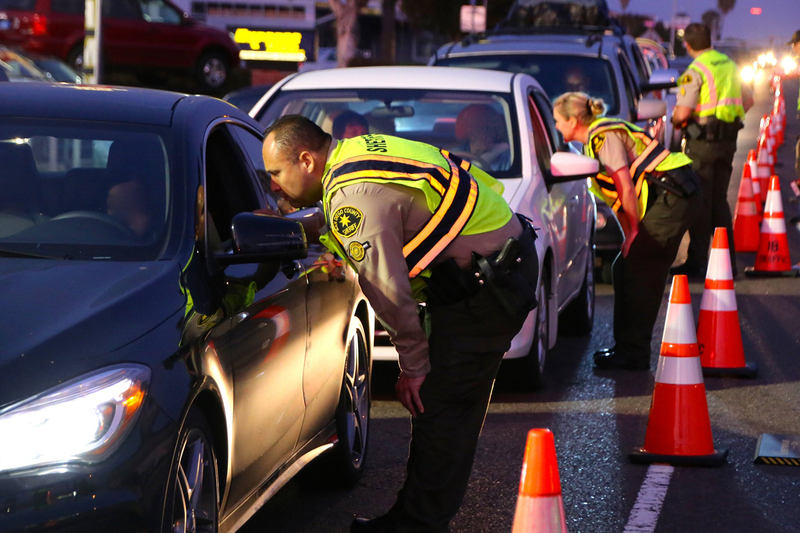 Last year, San Diegans turned in over 16,000 pounds of prescription drugs at San Diego County Sheriff’s collection boxes and almost 22,000 pounds during takeback events. Together, that is roughly 19 tons of prescription drugs. The next Prescription Take Back Day is Sat., Oct. 27.